The battle of the best is a continuing fight and when we look at the third quarter of 2011 we see that Samsung has taken the lead. We aren’t just talking about a slight lead here either. What you see in the picture below is a collection of results for the top 3 manufacturers and their results for Q3. 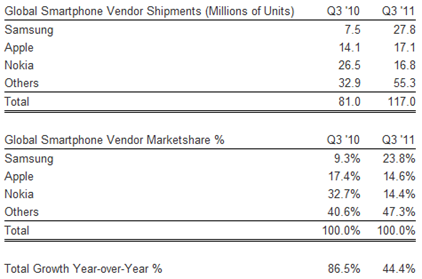 You can clearly see that the data shows Samsung with a 10 million unit difference in front of Apple. Samsung released their financial results for the quarter today and it seems that the patent issues aren’t holding them back! Now, the only problem is this; when Samsung releases its financial data they do not specify exact sales. They do claim that sales were up 40% but that in itself does not note the numbers that we see in the above image. We also need to look at the overall picture. If this is units shipped for Samsung, then we have to take into account that Samsung produces more than one phone in a variety of price ranges. This will target different demographic areas where cheaper phones are likely to sell. So you can understand why there might be a bigger push out units out of the warehouse. To make it even more clear, think of it this way; Samsung makes a wide variety of phones with refreshes popping out every now and then, while Apple just has three smartphones in the market, namely; the iPhone 4S, 4 and 3GS. I remember working in Kuwait last year and the market seemed more conducive for Samsung over Apple. Apple phones were being sold in Carrefour (a Wal-Mart like store) for roughly $1050 U.S. dollars, that’s a lot of money to people in the U.S. to spend on a phone and more importantly that is a lot of money for someone who is working in another country to make ends meet. Android based Samsung phones were being sold in a more reasonable price range of $500-600 U.S. dollars. These phones are also sold at an unsubsidized price, unlike what many are used to here in the States. So you aren’t tied to a contract there. So what I am getting at is this; what are the actual sales Samsung? Let’s say that Samsung produces 28 million devices but only sells 14 million and Apple produces 17 million and sells 16 million; who is really the top smartphone manufacturer then?